“Only about 30% of people ages 45 to 64 say they engage in regular leisure-time physical activity, and this falls to 25% of those between the ages of 65 and 74 and 11% of people age 85 and older,” the National Institutes of Health (NIH), part of the U.S. Department of Health & Human Services (HS), recently reported. This is surprising, the NIH report suggests, because of the proven benefits of exercise at any age. “Regular physical activity can improve your balance and boost or maintain your strength and fitness. It may also improve your mood and help you manage or lessen the impact of conditions like diabetes, heart disease, osteoporosis and depression,” the NIH report states. It is a key to preserving your physical function and keeping you independent as long as possible. For an inspiring example of what is possible with a lifelong dedication to exercise, see our feature story on Lillian Field Berkowitz. A former acrobatic dancer on Broadway and Vaudeville, Mrs. Berkowitz, now 102 years old, is still dancing and exercising every day. Asked what is the key to her longevity, she says without hesitation, “exercise!” A lifelong devotee of exercise, at age 102 she still walks 45 minutes (over a mile) a day, and does multiple routines of exercises of all kinds every day. “Endurance Exercises: Brisk walking, dancing and other endurance exercises improve the health of your heart, lungs and circulatory system. These exercises can make it easier for you to mow the lawn, climb stairs and do other daily activities. Strength Exercises: Strength exercises include lifting weights or using resistance bands. They can increase muscle strength to help with activities such as carrying groceries or lifting grandchildren. Balance Exercises: Balance exercises can help prevent falls—a major health risk for older adults. “By exercising regularly and including more physical activity in their daily routine, older people can preserve their physical function, which is key to doing the everyday things they want to do,” says Dr. Richard J. Hodes, director of NIH’s National Institute on Aging. “Even if you haven’t been active previously, it’s important to get started and stay active,” he says. To help older people get started and keep going with appropriate exercise habits, the NIH maintains a website, Go4Life, which provides a guide to exercise for older adults. The site was developed by leading experts on aging, exercise and motivation. It suggests exercises for people ages 50 and older, which are designed to be done safely at home without special equipment or clothing. The website is one of the resources supporting a new national exercise and physical activity campaign, called Go4Life, being sponsored by NIH focusing on helping people ages 50 and older. 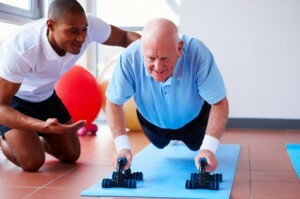 “Older adults can exercise safely, even those who have physical limitations,” Hodes says. “Go4Life is based on studies showing the benefits of exercise and physical activity for older people, including those with chronic health conditions,” he says. The core resource of the Go4Life Campaign is a free book, “Exercise & Physical Activity: Your Everyday Guide from the National Institute on Aging”. Other free materials, including an exercise DVD and tip sheets, Workout to Go, a mini exercise guide, and success stories and tips to help you stay motivated, are also available from the NIH. To learn more about exercise information available from the NIH, visit the Go4Life website. Or call 1-800-222-2225, or e-mail niaic@nia.nih.gov.